Time for a Turnaround at Teva Pharmaceuticals Industries Ltd? Are Teva's management and patent woes finally a thing of the past? Drugmaker Teva Pharmaceuticals (NYSE:TEVA) has had a few rocky years in an industry that has soared over the same period. The $38 billion generic pharmaceutical copmany has faced some serious management debacles and a looming patent expiration. 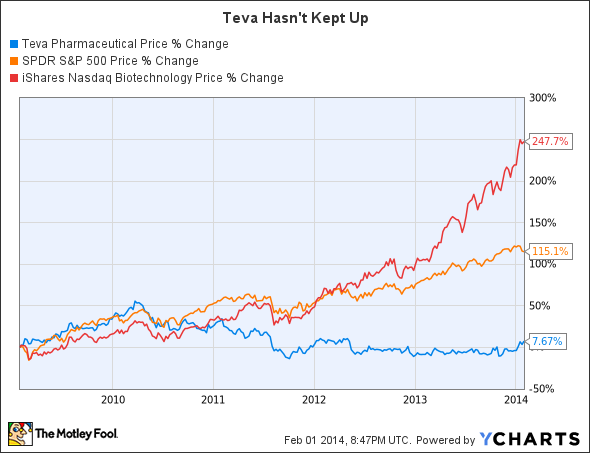 Teva Pharmaceuticals data by YCharts. 2014 has brought a glimmer of hope to the embattled company, but can new management and an improved blockbuster fend off competition from Biogen Idec (NASDAQ:BIIB) and Mylan (NASDAQ:MYL)? When former CEO Jeremy Levin signed on to head Teva in 2012, he knew the job would entail some tough love to prepare for the impending patent expiration for blockbuster multiple sclerosis drug Copaxone. I'm sure he never guessed polygraph tests would be involved, though. After leaks revealed a rift in management's relationship with the Board of Directors over implementing cost cuts, Levin allegedly subjected board members to polygraph tests to plug the leak. That's not particularly Foolish management, and not surprisingly Levin departed the company soon after. Now Teva has a new head in CEO Erez Vigodman. Vigodman has a history of reforming unprofitable businesses and plans to continue Levin's cost cutting initiatives. The execution of this plan in the coming years is critical to boosting the company's profitability. While Teva is known as one of the largest generic drug manufacturers, 20% of its third quarter revenue came from the branded drug Copaxone. That revenue comes with a much higher margin than Teva's generic offerings, and contributes much more to net income. That means that when Copaxone loses patent protection in May of this year, Teva could face a big hit to its top line, and an even bigger hit to its bottom line. So far, management has been unable to protect that revenue with a failed Supreme Court injunction and poor results for new MS drug Nerventra. Last week, Teva and its shareholders received some uplifting news when the FDA approved a new, longer acting three-per-week dose of Copaxone, granting that formulation market exclusivity. Copaxone could still face generic competition for its once-daily injection, and Mylan is hot on the chase with a biosimilar version slated to hit shelves as soon as the patent expires. The biosimilar still requires FDA approval, but it could spell trouble for Teva if approved. This leaves the company only a few months to convert patients to the new formulation before a major pricing war kicks in. That conversation is moot, though, if Biogen keeps rolling as it has been. Sales of the orally available multiple sclerosis drug Tecfidera have been crushing already lofty sales expectations. The drug brought in $876 million in its first year on the market, even while Biogen's other MS offerings Tysabri and Avonex continued to grow. Couple that with growth in other orally available drugs from Novartis and Sanofi, and Copaxone, even with an improved dosing schedule, could continue to lose market share. New management could certainly bring life to the struggling company. If the new formulation of Copaxone can grasp market share before Mylan unrolls its biosimilar, then Teva should be able to stave off the competition. If not, the combination of generic and next-generation competition could wipe out revenue and earnings for some time. Cost-cutting can soften the blow, but it can't carry the bottom line forever. The real goal for Teva should be to improve its generics pipeline, as growth of that sector has also stalled.